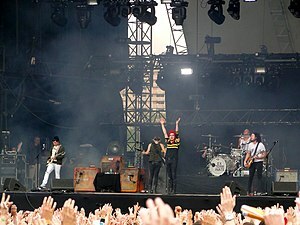 My Chemical Romance performin in 2011; frae left tae richt: Frank Iero, Mikey Way, Gerard Way, Michael Pedicone, Ray Toro. My Chemical Romance (eften abbreviatit as MCR) wis an American rock baund frae New Jersey, active frae 2001 tae 2013. The baund's best-kent lineup conseestit o lead vocalist Gerard Way, guitarists Ray Toro an Frank Iero, bassist Mikey Way an drummer Bob Bryar. Foondit bi Gerard, Mikey, Toro, Matt Pelissier, an later jyned bi Iero, the baund signed tae Eyeball Records an released thair debut album I Brought You My Bullets, You Brought Me Your Love in 2002. Thay signed wi Reprise Records the next year an released thair major label debut Three Cheers for Sweet Revenge in 2004. Shortly efter the album's release, Pelissier wis replaced bi Bob Bryar. A commercial success, the album wis awairdit platinum status ower a year later.